Recognizing the need for structured, supervised activities for middle school children on early release days, several community partners have come together to create the “Get in the Game” early release day programs. the library director noticed the need for some structured options on early release days. Upon being released at 10 am, students were heading to the library or wanting to use the town hall gym, but there was no planned programming or supervision. “That was hard, without a plan in place,” said Brooks. Jen Alvino, director of the Windham Public Library, said large groups of students were arriving at the library when school let out at 10 and staying until late afternoon. “Linda and I started talking about things we could do to work together, just to be able to offer something else so that the kids weren’t out in the community without supervision or having things to do for such a long period of time,” she said. Brooks said the parks and recreation department tried to offer some programming, but without a specific place to gather, they were limited to off-site trips. With just a van to transport students, capacity was limited, and they quickly had a waiting list, Brooks said. Conversations began among several community partners to discuss solutions. These partners included the library, Be the Influence, the town manager, the superintendent and school principals, and the police department and Officer Cyr. “We put our heads together to try and come up with something that serves more people,” Brooks said. Out of those conversations came the current format for “Get in the Game”. Students are released to the Middle School cafeteria, where lunch is served. From there, they have several options to choose from, including a mix of active and calmer activities. Programming runs from 10 am to 2 pm. The cost is $15 per person. So far this year, activities offered have included a wide range of choices to meet the needs of all students. 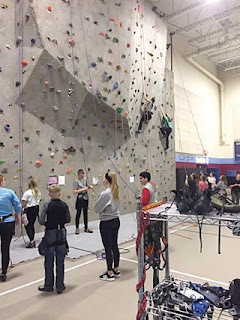 Some of the options have been a 3 on 3 basketball tournament; rock climbing at the High School; Wii games, movies and other activities at the library; an inflatable obstacle course; arts and crafts in the cafeteria; and a community service project at MSSPA. The collaboration between community partners has helped the model be successful, Brooks said. Alone, none of the partners involved had the capacity to offer programming to a large number of students. Alvino agreed that the collaboration between all the different community groups has made all the difference. “I think we’ve really been able to offer something really cool and unique for the kids in the afternoon,” she said. In addition to staff from the various partners, high school students have volunteered to help facilitate activities. The students in the Dare to Adventure program have also been participating as peer leaders. “Without that additional level of volunteer effort, we just couldn’t serve as many kids,” Brooks said. Having input from so many partners allows for a wide range of ideas and activities. “When you’re bringing different groups together, there’s lots of ideas and different skill sets that people can offer to the effort,” Alvino said. “Get in the Game” activities have been offered on three early release days so far this school year. A fourth day is planned for the May 6, 2019 early release day. Families can register students through Windham Parks & Recreation.